On Tuesday 20th of August the Year 12 Classics students went on a trip to downtown Auckland and the Museum to do research for their ‘Architecture for Art’s Sake’ internal. Luckily Zeus was shining down upon us because despite a terrible weather forecast we had a beautiful sunny day. The students were told to research similarities and differences between classical Greek buildings (like the Parthenon in Athens) and modern day examples in Auckland. To the students' surprise, most buildings in Downtown Auckland had elements of classical architecture and as we walked around looking at buildings the students were amazed to see that almost every second building was based on designs from Ancient Greece. The students spent some time looking at the exterior and the interior of the Britomart building which exhibits strong Classical features. Our trip culminated in visiting the Auckland Museum, which is the best example of classical architecture in Auckland. The students took lots of photos of the exterior of the building and we explored other architectural features both inside and outside the museum. Students also observed classical influence in the form of sculptures that decorate the interior of the museum. For some students this was their first time at the museum and for others they had never really looked at the building itself so they were blown away by the scale and monumentality of the building and how closely it is related to its Greek counterparts. Overall it was a very successful outing and I’m sure the year 12 classics students will not see Auckland City the same way again! 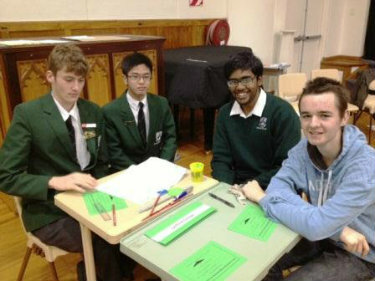 The Year11 Geo quiz team competed last week in the Auckland round of the Maatangi Whenua competition run by the NZ Board of Geography Teachers. 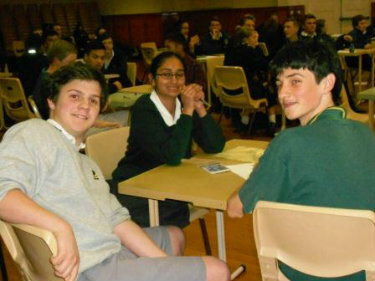 The team of Tanisha Shah, Alex Stone and Ryan Williams competed with focus and enthusiasm and they were excited to be in the lead after the first three rounds. However, a couple of not so good rounds saw them end up a creditable 4th overall. One of the markers commented that they were surprised they didn’t win as they had great geographical knowledge. For a brief period, surfers at Muriwai on Auckland’s west coast, were outnumbered by oranges, grapefruit and lemons bobbing on the waves. However, the citrus was not an exercise in marmalade making. 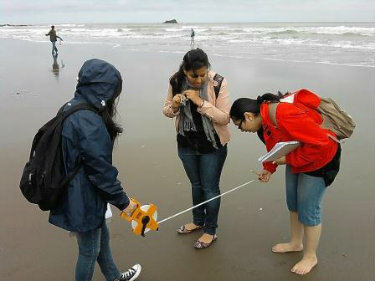 Year 13 Geographers were using them as floats, to determine the direction and velocity of sea currents in the area. 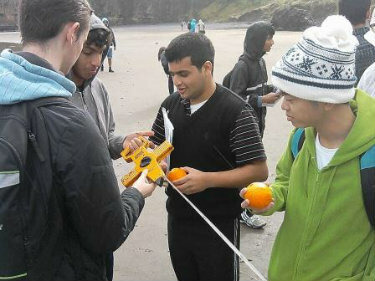 The brightly coloured, biodegradable fruit were easy to see from the beach and provided results the students needed for their Research internal assessment. 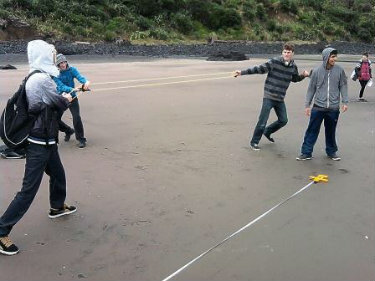 Other experiments involved determining how much sand was being ‘saltated’ (moved) by the wind and whether there was a difference in beach slope angles between Muriwai beach and neighbouring Maori Bay. Unaware of this, the surfers were probably more concerned how close Giacomo’s catapault was going to hurl the next orange. 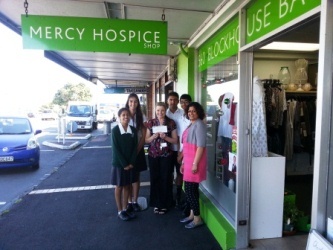 An impressive performance by four Lynfield College students placed them 3rd out of the 28 Auckland schools that entered the Year 12 and 13 Geography competition. Giacomo Gambassi, Mason Ng, Akash Charles and Nick Waddington were awarded certificates and movie vouchers for their achievement. 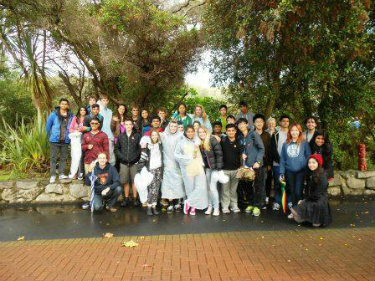 Rotorua seethes with volcanic drama, but it was the prospect of rain that caused trepidation for a number of Year 13 Geographers. 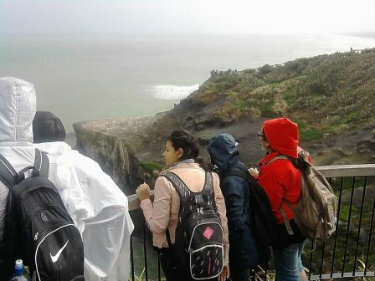 The forecast threatened the annual field trip to study how tourism operates in one of New Zealand’s premier destinations. 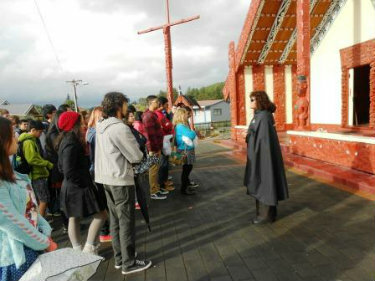 However, armed with ponchos and umbrellas we enjoyed the thermal environment of Whakarewarewa and experienced the recreated Maori village of Tamaki Tours. Following a concert, the 40 students and staff enjoyed a fabulous hangi meal of kumara, potatoes, fish, pork, lamb, also salads, pavlova and steamed pudding. The sunshine and clear blue skies on the second day made it easy for students to research tourism business in the city centre. Following a lesson on tourism development at the museum, the group set off to Skyline Skyrides for gondola and luge rides. In addition to Geography students there were several Tourism students on the trip who were hosted by the Sir George Seymour College of Tourism. Lynfield College staff have numerous opportunities to extend their professional expertise. 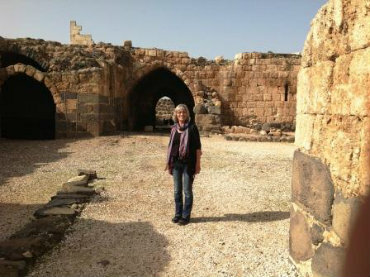 Ms Susan Jacobs reports on a very interesting one which she attended a few months ago. Sponsored by the Holocaust Society of New Zealand and the Israeli Foreign Affairs Department the visit was of special interest to staff in the Social Sciences Faculty. "I had the unique experience of spending the last two weeks of the summer holidays in Jerusalem attending a series of seminars at Yad Vashem, The Holocaust Memorial Museum. Together with 20 History and English teachers from all over New Zealand we were given the opportunity of studying the impact of the murder of six million Jews in Nazi occupied Europe during World War Two. Among our lecturers were survivors from the concentration camps and a marvellous couple who were original survivors from Schindler's List. It wasn't all work. 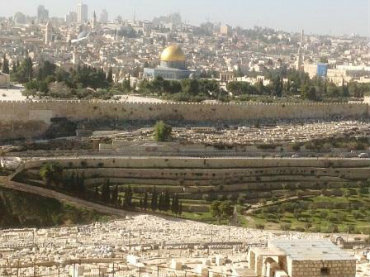 Jerusalem is rich in different cultures and religious traditions and we visited many fascinating sites I had heard of all my life, such as Bethlehem and Masada. As teachers of this period we aimed to deepen our knowledge and gain a uniquely immediate perspective that we will hopefully impart to our students. 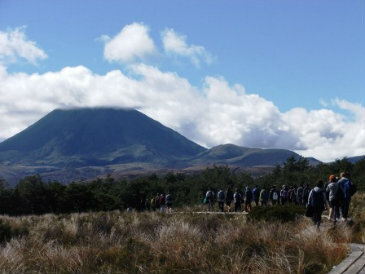 Recent eruptions of Mt Tongariro didn’t deter Level 2 Geography students from their field trip to the national park on 7-9 April. In fact, it is thanks to eruptions over thousands of years that the unique landscape of the area exists. 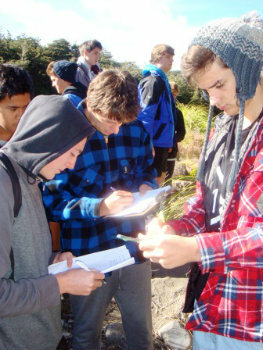 Students gathered data on stream velocity and vegetation types for the Research internal assessment and interviewed locals for the Geographic Issue assessment – asking whether ski field development should be allowed on Mt Ruapehu. 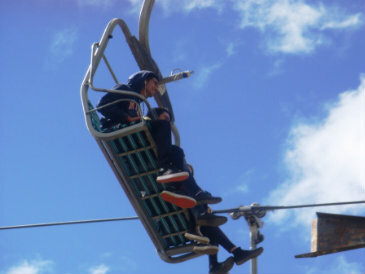 With study completed, the group rode the chair lifts to the highest café in New Zealand at 2020m. The return trip included a relaxing soak in the thermal pool at Tokaanu. On Tuesday February 12 60 Year 13 History students visited the Auckland Sky Tower and the Central Library in order to complete their research assignment into "An event of significance to New Zealand". Topics the students have chosen include the 1981 Springbok Tour, the signing of the Treaty of Waitangi, the Erebus disaster, the nuclear free New Zealand movement, the 1951 Waterfront Strike, the Bastion Point Occupation, the impact the Great Depression had on New Zealand, the campaign to get women the vote and New Zealand’s contribution to the Boer War. 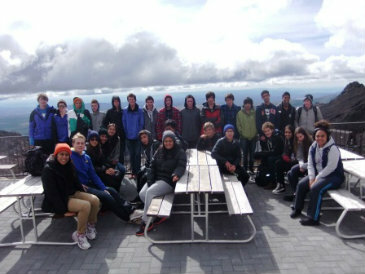 The visit to the Sky Tower was an opportunity for the students to learn how Auckland developed and see where some of the sights of significance were located such as Marsden Wharf the site of the 1985 Rainbow Warrior bombing and Bastion Point which was occupied by protestors for 506 days in 1977 and 1978. They then went to the Auckland Central library where they used the research centre and special collections to look up old newspapers on microfilm and Hansard parliamentary debates. The librarians were kept very busy fulfilling all the orders the students made for books from the basement which they dusted off and used for their research. A good day’s work was completed by all the students. They will continue with this for the next two weeks at school. The next step in the research process for many of the students is to conduct some interviews with people who may have lived through these events (although the suggestion from the students that they could visit the old folks' home to interview people who might remember the anti-nuclear protesting from the 1980’s drew looks of horror from their obviously very ancient teachers! ).